Several Native American tribes inhabited this area because of the fresh spring water available. The expedition of Domingo Terán de los Ríos of 1691, followed the "El Camino Real" (today a National Historic Trail) which crossed the Guadalupe River near today's Faust Street Bridge. Subsequient French and Spanish expeditions, including those of the Marqués de Aguayo and Louis Juchereau de St. Denis, commonly passed through this area. In 1825, a Mexican land grant gave title of the area around the springs to Juan M. Veramendi. 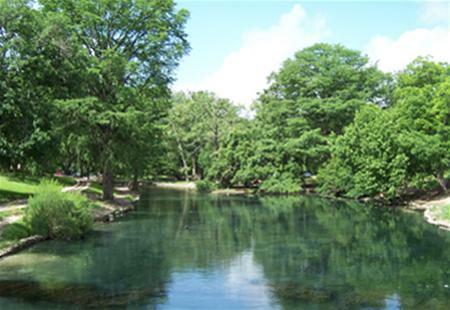 During the eighteenth century, the springs and river (which had been called Las Fontanas and the Little Guadalupe respectively) took the name Comal, Spanish for "flat dish" and Guadalupe.